If you grew up in Union County or are a New Jersey news media junkie, you might remember the Elizabeth Daily Journal. 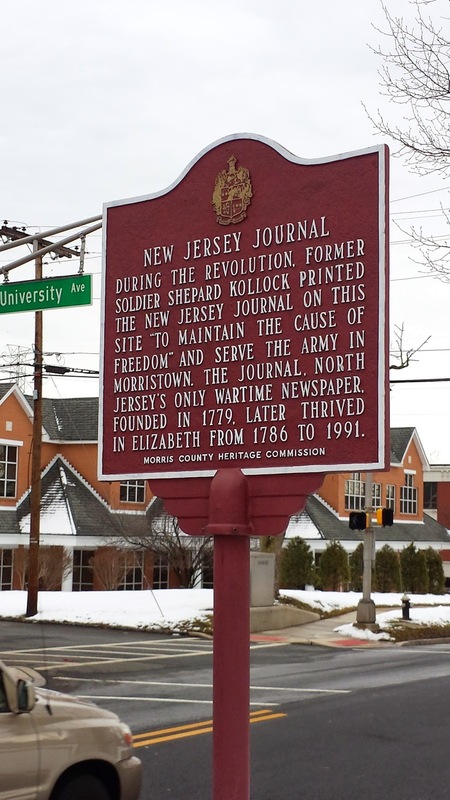 Before finally succumbing in the early 1990s, the Journal proudly proclaimed its status as New Jersey's longest-printed newspaper, founded in 1779. What many of us didn't know was that wasn't always printed in Elizabeth, one of the state's oldest cities. Rather, it was born in the much smaller community of Chatham. The other day I headed to this tidy Morris County town to check out what I thought was the site of the Journal's first printing press, marked by this sign on Main Street. The timing of the paper's founding during the depths of the Revolutionary War, combined with the longevity of its existence, would lead you to believe that the Journal had started its life as a pro-independence broadsheet. With Washington's encampment just a few miles away in Morristown, it wouldn't seem logical or probable that a Tory or Loyalist newspaper would survive after the war ended. But still, I wondered about printer Shepard Kollock, noted on the historical marker as a former soldier. Why had he left the military? Had an injury sidelined him? Was he needed at home yet still eager to support the cause with his profession? Back at Hidden New Jersey headquarters, we discovered this was another case of the information that wasn't included on the marker being just as interesting as what is. The short answer, courtesy of The WPA Guide to 1930s New Jersey, was that Kollock, "an ink-stained Revolutionist," resigned from the Continental Army "for the more vital task of combating the Tory press of New York City." True, but that's not the complete story. Look further, and you'll discover that while Lieutenant Kollock may have left the army, it was with more than the blessing of his superiors. It was with their direct support and encouragement, born from an acute need. No newspapers were published in New Jersey at the start of the war, leaving state residents to rely on the highly-slanted and misleading Tory propaganda sheets from New York. Though a Patriot-friendly New Jersey Gazette was published in Burlington, its circulation area fell far short of northern and eastern New Jersey, leaving residents with no news source critical of Great Britain. Continental Army leadership realized that if the battle for hearts and minds was to be won, they'd have to get someone to publish a newspaper that promoted the cause of freedom and boosted troop morale. Who to do it? Alexander Hamilton, stationed in Morristown with General George Washington at the time, suggested Kollock, whom he knew had been a printer in the West Indies. Washington and General Henry Knox agreed, either allowing Kollock to resign or giving him an honorable discharge, depending on which source you cite. The influence of his press, it seemed, was worth far more than whatever he would contribute militarily. The Continental Army gained an ardent and exceptionally loyal mouthpiece eager to publish news provided directly by Washington's Morristown headquarters. That's not to say that Kollock had an easy life as writer and publisher of the Journal. Though the army supported him, fed him information and ensured he had sufficient paper stock to publish, his safety was another issue altogether. He had to move his press several times, as he was constantly under threat of being captured by the British. In fact, it's not entirely clear to me when he published at the exact location of the historic marker I visited. Other sources say that at some point he printed from a back room in a building that once stood somewhere on the current location of the Mall at Short Hills. His other covert locations? They may be marked with plaques on rocks around town, but I haven't found them yet. Both publisher and newspaper survived the war well; Kollock even moved to New York once the British evacuated to start a paper there. After returning to New Jersey, he founded another newspaper in New Brunswick before moving the Journal to its final hometown of Elizabeth in 1786, operating at 39 Broad Street. He sold the paper in 1818 after being appointed the city's postmaster. Today Kollock is remembered in his onetime hometown of Chatham with a ballfield named in his honor, hopefully reminding kids that the power of the press is mighty and potent. I'll admit it: Morris County confuses me sometimes. Having grown up to the east, my primary reference point to the county was its very historic seat, Morristown, and I rarely had an occasion to go much farther beyond. If I had to go anywhere beyond, I'd usually take the quick route on Route 80 or, on occasion, a county road. Thus, despite four years of Hidden New Jersey barnstorming, I still get a bit disoriented on solo trips in the region. This all came to a head over the weekend, when I endeavored to track down a few mills said to be in Warren County. I set myself to take Route 57 west from its terminus in Hackettstown, maybe stop in one or two of the old canal port towns if I got that far. Usually it's a matter of taking Route 46 to Hackettstown and keeping an eye out for signs leading to 57. Usually. This time, as the great philosopher Springsteen once sang, I took a wrong turn and I just kept going. More accurately, I didn't take a turn when I was supposed to. Things didn't feel quite right from the start, but I persisted as the road brought me further away from 57 altogether. A street sign at an intersection told me I was on Schooley's Mountain Road. Okay... this is different, I thought as the road started climbing in elevation. Still doubtful, I was somewhat reassured when I passed the Washington Township Police Department building. There are no fewer than four communities in New Jersey named for our first president. Could it be this was part of Washington, Warren County, the community along Route 57? Could two of them be within mere miles of each other? As it turns out, yes, and Schooley's Mountain takes up a good part of the Morris County version. At about 1200 feet high, it's a commanding elevation, and its namesake road twists a bit as it descends into Long Valley. The chances of me getting to the mills within my time frame were waning with every mile of country road I took forward. A quick look at the map revealed that it was quite a distance to the next major highway. Schooley's Mountain Road, a.k.a. County Road 517, was once the Washington Turnpike or Morristown-Easton Turnpike, leading to CR 513, which leads to, well, more countryside before it gets you to a more modern highway. I'd be lucky to find a gas station for miles. Fuel for me was a little easier to find: the Schooley's Mountain General Store puts together a decent fresh mozzarella and roasted pepper sandwich with pesto. As I lunched, I perused the WPA Guide to 1930s New Jersey to determine whether I was close to tripping on a good story. I discovered that the mountain was named for the family that once owned farmland there, but that's just incidental to its true claim to fame as New Jersey's first resort, perhaps the nation's as well. 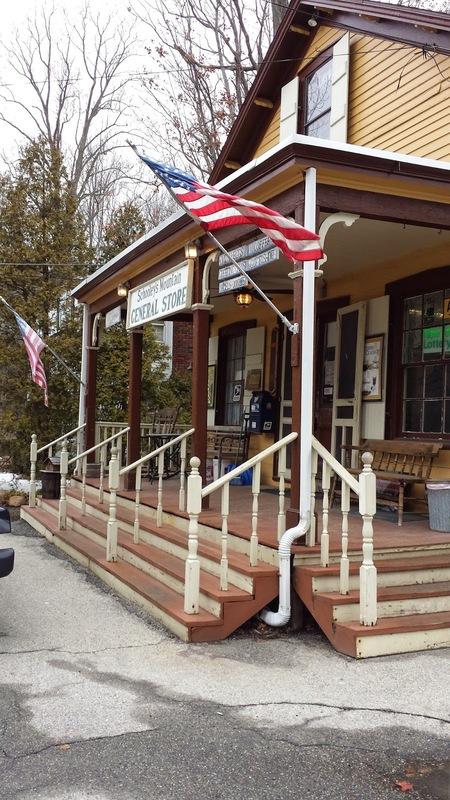 Morris County is well known to historians as an iron-rich region, once hosting colonial-era mines that earned it reknown as the arsenal of the Revolution. It wasn't the ore that drew thousands of people to Schooley's Mountain, however. It was the waters. Known alternately as chalybeate or ferruginous waters, or salts of iron, the mineral content of the Schooley's Mountain springs were acclaimed for their healing powers, first by the Lenape and then by European settlers. Visitors seeking the waters' restorative powers first stayed on the site in tents. The history is somewhat cloudy, but from what I can tell, Joseph Heath was the first to capitalize on this natural phenomenon, opening accommodations on the mountain in 1801. He later built a larger facility called Heath House, which then drew competitors as well as regular visitors. By 1815 the springs were well known to be the purest of their kind in the nation, drawing health-minded devotees from all over. Depending on the source, two or three more inns were built and by the late 19th century, accommodations for a few hundred were available to people who wanted to sample the spring or just get back to nature, away from the chaos of America's burgeoning cities. Schooley's Mountain reportedly attracted a wide range of celebrities, some even taking a break from their vacations to spend a few days. President Grant and his daughter stayed at the mountain's Belmont Hotel when they wanted a change from their summer visits in Long Branch. Rosters of the notables who are said to have taken to the waters include all the usual suspects: the Vanderbilts, Roosevelts and Thomas Edison, as well as several governors and former governors. It was all gone, however, by the 1930s, apparently for the reason so many other New Jersey vacation spots suffered: improved transportation made it easier for visitors to go farther afield to other resorts. Detonation for a road construction project had reportedly ruined the spring site; some stories also note that the spring house itself was dismantled by highway workers. According to Henry Charlton Beck in The Roads of Home: Lanes and Legends of New Jersey, the Heath House may have been taken down and moved to Brooklyn. When I hear stories of natural resources made inaccessible, it leads me to wonder whether they've simply been taken out of public view. Today, there's a Heath Village on the Hackettstown end of Schooley's Mountain Road, a seniors facility that offers a range of options from independent living to nursing care. A conspiracy theorist might wonder if the home's operators have hit upon something: could the waters extend life? Do the locals guard a still-existent spring from the outside world, sheltering it from future exploitation? What it all says to me is that there's room for much more Hidden New Jersey exploration on Schooley's Mountain. And I wouldn't mind grabbing another sandwich at the general store. A recent visit to the Great Swamp National Wildlife Refuge in Morris and Somerset Counties led me to think again about how close we came to losing this marvelous natural resource to development. As you might remember from our earlier story, the Refuge is the hard won project of environmentalists who stopped the marshland from becoming a massive regional jetport. Thing is, for as much as people will marvel over the folly of replacing this pristine wilderness with an airport, nobody talks about WHY exactly we needed one there… and why Newark International Airport wasn’t deemed sufficient for the flying public. When I researched the issue, I discovered a fair amount of discussion about the need for longer runways to accommodate massive jets – seemingly more that Newark might be able to accommodate. I also came upon a seemingly forgotten aspect of the history of EWR, an unfortunate series of events that virtually cried out for a new airfield in the region. Locating an airport in a congested area wasn’t the planners’ original intent. Today’s Newark Liberty International Airport stands in heavily developed industrial sections of Newark and Elizabeth, bordered by the New Jersey Turnpike and Route 1, but it wasn’t always that way. Most New Jerseyans don’t recognize the area for what it once was: some of the southernmost portion of the Meadowlands. When sited in the late 1920s, the airport was built on damp marshlands in the outskirts of Newark. More than 1.5 million cubic feet of dry fill went into the soggy wetness to prepare it for paving and building, including 7000 Christmas trees and 200 metal safes. Airport operations proceeded without complaint or danger to local residents because, well, few if any people lived there. With the passage of time, that changed. Normal industrial development, fueled by population shifts during World War II and the Port Authority takeover of Port Newark, brought more businesses into the area. Being close to the airport meant goods could be shipped rapidly, efficiently and more cheaply, so if your business wanted to grow beyond New Jersey, you wanted to be in what was once the swamp. Workers naturally wanted to live closer to their jobs, spurring residential development. Before you knew it, the “out of the way” airport had more neighbors than its architects probably ever imagined, and Newark was the second busiest commercial airfield among many competitors in the area. The airport’s operations people, however, apparently didn’t recognize the potential dangers of routing aircraft over congested areas. That changed on December 16, 1951, when Newark and Elizabeth fell victim to what was then the second deadliest commercial air disaster in the United States. Fifty-six people died when a C-46 aircraft crashed into the Elizabeth River shortly after takeoff from Newark. Just a few weeks later, on January 22, 1952, a twin-propeller airplane was attempting to land when it crashed into a house at the intersection of South and Williamson Streets in Elizabeth, after nearly hitting Battin High School. Three crew members, 20 passengers and seven people on the ground were killed. A third accident, on February 11, was the final straw. After losing a propeller on takeoff, a DC-6 crashed, reportedly near an orphanage. Four on the ground died, along with 26 of the 59 passengers and three of the four crew. The Port Authority closed Newark Airport, raising questions as to whether it should ever reopen for commercial traffic. Airlines moved their EWR-based operations to LaGuardia and New York International (now JFK), leading some to wonder whether those carriers would return to Newark… if the airport ever reopened. Ultimately, the airport was closed to commercial traffic for nine months, with the military using it only for defense-critical operations during daylight hours and good weather. Local mayors called on New Jersey Governor Alfred Driscoll and the state legislature to keep the airport closed and push the Port Authority to seek alternative locations in less populated areas for a new major airport. Port Authority Executive Director Austin Tobin, however, had other plans. The agency continued its work on a new runway and issued a contract for the construction of an additional passenger terminal, clearly signaling that EWR would be back in business. Meanwhile, aviation ace Eddie Rickenbacker led the National Air Transport Coordinating Committee in developing new flight procedures for the airport. When announced in November 1952, the rules eliminated all takeoffs and landings over the densely populated sections of Elizabeth where the tragic crashes had taken place. Instead, aircraft would be routed over the Kearny Meadows. Newark Airport reopened on November 15. 1952 and slowly came back to life as operators moved flights back from the other two major regional airfields. However, the concept of an farther-flung airport was still in the minds of some. Land owners in Lakewood, 60 miles south of Newark, offered acreage for a new, modern facility, proposing that a Pinelands-based airport could easily be connected to the Turnpike for easy access to both New York and Philadelphia. The airlines, however, rejected the concept. Much of the appeal of Newark was what had made it so congested in the first place: proximity to industry, people and New York City. Newark continued to grow even as the Port Authority fought for the proposed jetport in the Great Swamp. New terminals were built, airlines added new flights and routes, more people than ever saw the convenience of flying out of EWR instead of JFK or LGA. Thankfully, no additional fatal crashes have occurred in the neighborhoods surrounding the airport, a trend we hope will continue indefinitely. Research often makes an interesting story even more fascinating. Case in point: pigeon bras. Pigeon bras? You certainly knew that birds have breasts (so to speak) but so much so that they need support? Well... not really. It all starts with a bit of reading I was doing for Women's History Month, where I stumbled on the story of Ida Cohen Rosenthal. A Russian immigrant who arrived in Hoboken in 1904, Ida soon married, bought a Singer sewing machine and went into business for herself as a dressmaker. Within 15 years, she and her husband William were operating a factory with 20 workers, but their time in Hoboken would be cut short due to snow. It wasn't that the white stuff was preventing their workers from getting to the shop, or curtailing their deliveries. What infuriated the Rosenthals was the fact they had to manage it. City statutes required property owners to clear snow from the public sidewalks in front of their buildings, and the couple apparently didn't want to be responsible for that task, sizable though their shop might be. Rather than hiring people to shovel their walk, they moved across the river, decamping to Washington Heights. Their business prospering, the Rosenthals partnered with a friend, Enid Bisset, in a new Manhattan dressmaking venture, Enid Frocks. It was the 1920s, and the flapper look was in style, with its waifish, boylike appearance. To fit into the vogue fashion, women would bind their bosoms with plain strips of cloth to approximate a flat chest, despite their natural dimensions. Ida and Enid went one step beyond and created a bandeau that hooked in the back and cupped a woman's natural curves. Their dresses appealed to the more womanly customer, who didn't like the restrictive feeling of the fashion of the day. Including a brassiere with the purchase of an Enid Frocks dress, Ida and Enid apparently didn't initially recognize the bonanza they had created. Their customers would have to show them. And, indeed, they did: after buying an Enid Frocks dress and accompanying bra, women would return to buy more undergarments, which the women accommodatingly sold them for a dollar apiece. Ida created the brand name "Maiden Form" to differentiate the womanly bras from the boyish look of the flapper fashion, and the undergarment business took off, despite warnings from her brothers, who told her to stick with dresses. In fact, it was the bra, not the dress, that kept the company afloat after the stock market crash of 1929, when competing dressmakers went out of business. Already, the success of the business had led the Rosenthals back to New Jersey when Maiden Form outgrew its New York factory. According to some sources, it eventually became one of the largest employers in Bayonne, doing well throughout the Great Depression. Which leads us to... pigeon bras. Maiden Form, like virtually every manufacturer in the United States, had to fight tooth and nail to get raw materials during World War II. If it wasn't needed for the war effort, it wasn't going to get to the factory. Ida, in her own spunky style, convinced government officials that her business was absolutely essential. Wouldn't women serving in the WACs and WAVES face fatigue without the right support from a Maiden Form bra? (Ironically, Jane Russell would famously support this concept for another manufacturer in commercials for the 18 hour bra.) Parts of the business also converted to parachute making, while yet another group at the Bayonne factory turned out pigeon vests. Sewn from bra fabric and attached to a paratrooper's gear, the vests enclosed a carrier pigeon, which the paratrooper would release with a message once he'd landed in enemy territory. Soldiers being who they are, the vests quickly became known as bras. 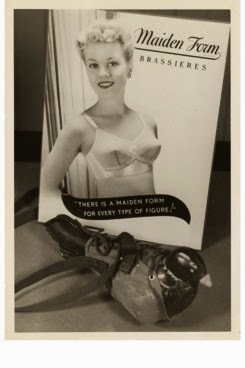 The challenge of wartime shortages overcome, Ida brought her company into the late 40s and 50s with a series of innovative advertising campaigns that kept Maiden Form in the vanguard of women's undergarments. William had already made substantial contributions to design, including standardized cup sizes to ensure women could find a reliable fit, time after time. By 1960, the company's name had evolved to Maidenform, its founder still active in the business at an age when most folks would have retired. The business had expanded into Europe and Latin America, its manufacturing moving to southern states and Puerto Rico. Ida continued to work until suffering a stroke at the age of 80, leaving Maidenform in the capable hands of her daughter. Today, Maidenform is part of Hanes Brands and retains offices in Iselin, its former Bayonne factory now converted into chic apartments. You have to wonder how many people know the unique way the small city supported the troops in World War II... or, for that matter, millions of American women. I do know that the next time I drive down Avenue E, I'll give a small salute and a knowing grin to the pigeons hanging out in front of the brick building at number 154.